Drones have flown into new territory as the technology becomes more affordable and the Federal Aviation Administration looks to relax previously prohibitive regulations. The reason in simple. Drones have near limitless uses and can be a critical tool to help government agencies operate more efficiently, obtain actionable information – and, more importantly, save lives. 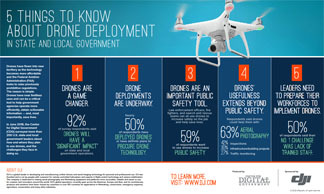 Download this infographic to learn how drones can be a game changer for your agency.